Mines lets you explore a mine. The object of the game is to visit all of the rooms and return all the treasures to the entrance without making too many moves. Specifying a different mine number at the beginning of a game gives you a different mine to explore. 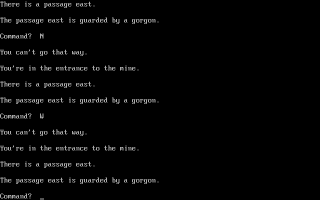 Commands in the game are “N”, “E”, “S”, “W”, “U”, and “D” to move North, East, South, West, Up, or Down, respectively. Other commands are “C” to carry things, “I” to inventory what you are carrying, “L” to leave treasures, “P” to get the points you’ve scored, “O” for help getting out of the mine, “H” for help, and “Q” to quit.